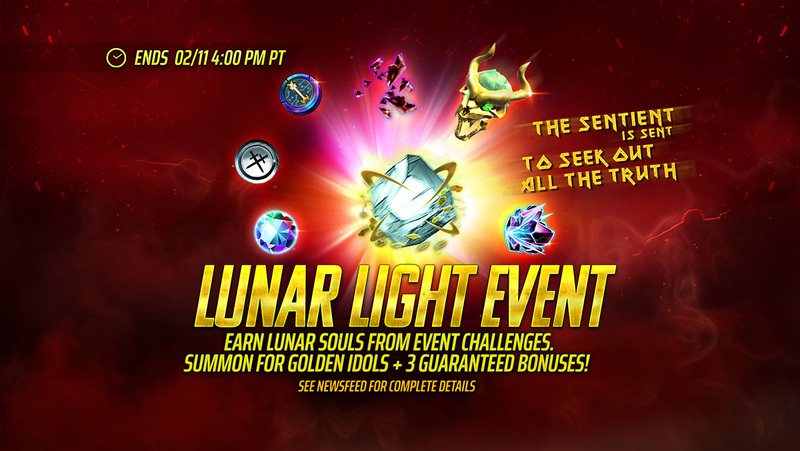 04 Feb Claim Guaranteed Bonus Rewards – Lunar Light Event on NOW! Earn GUARANTEED bonus rewards from Lunar Souls! From February 4th until February 11th at 4PM PDT, complete event challenges to earn rewards such as Blood Fragments, Magus Epic Souls and Lunar Soul Fragments!. Collect 200 Lunar Soul Fragments to obtain 1 Lunar Soul! The Lunar Soul guarantees a 3⭐-to-5⭐ Gold Idol as well as 3 bonus rewards. In addition to Lunar Light event challenges, we have also launched the Lunar Festival Calendar! From February 4th until February 18th at 4 PM PT, a special event calendar is available! Every day you log in will earn you a free reward from this calendar, with a massive pile of goods earned on the final day! Please be aware that a “day” for our game starts and ends at 4 PM PT (the same time when many other features reset themselves).